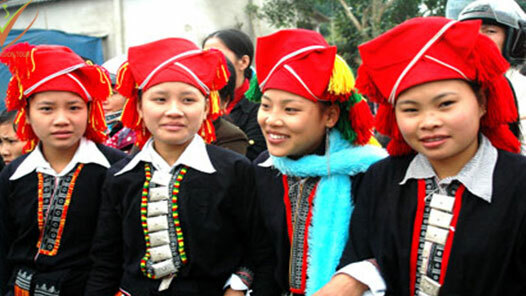 The Giay ethnic minority people pay special attention to children. When a baby is born, it’s a great joy to the whole family and clan. Their expectation for the child is reflected in the naming ceremony which embraces the cultural identity of the Giay. According to the Giay’s customs, a new-born baby is given a name when he or she is one month old. But the naming ceremony is held a couple of days before or after they are one month old because this creates a better chance for further growth. Some families even hold the naming ceremony a few months after the baby is born. The Giay don’t discriminate between boys and girls, but a bigger ceremony is often held for the first-born child. San A Son, Giay ethnic person in Lao Cai province, said for the first-born child, we often hold a naming ceremony 30 to 33 days after she or he is born. We choose a good date for the ceremony. All the relatives of the baby’s parents are invited to the ceremony, so the ceremony is quite big. The procedures of the naming ceremony of the Giay people are simpler than for other ethnic groups. They don’t always invite sorcerers to the ceremony. The offerings include pork, chicken, duck, incense and flowers. When the offerings are ready, the ceremony begins in the presence of the whole family. The baby’s grandparents or aunt bring the baby to the altar to introduce her or him to the ancestors. San Chang, a researcher of the Giay culture, said when people are eating, the baby’s parents bring out a tray with 8 cups of colored wine, one incense urn, one bowl of rice, and one egg, which stands vertically. “They bring the tray to the elders in the family and ask them to give the baby a name. The eldest one has that honor. He/she chooses a name and then puts some rice on the egg, if any rice seeds remain on the egg, the name is chosen. Otherwise, other elders continue to put rice on the egg until some rice remains on it,” Chang said. The name of the baby must be different from any relative within 3 generations. After a beautiful name is chosen and the family approves the name, the name is given to the baby. Everyone drinks a toast and gives the baby gifts along with wishes of luck, health, and happiness. The gifts are often bracelets, silver coins, cookies, or cash. The family of the baby’s mother must attend the naming ceremony. Chang explains “That day, a delegation of the baby’s mother’s family comes. They prepare a set of gifts including a baby carrier and diapers. When the baby is given a name, they give her or him the baby carrier and sing a song about the tilling soil to grow cotton, and weaving fabric to make the baby carrier. They also wish the baby growth and health. The father’s family responds by singing thanks for the baby’s gifts”. The gifts are placed on the altar together with offerings to show the ancestors that the baby has been given a name. If this is the first-born child, the grandparents and parents will thereafter be referred to using the baby’s name. San A Son said “If a couple is married but have not had a child, they are called by their original names. After they have children, they are called by their first-born child’s name. For example, if the baby’s name is A, the parents and grandparents will be called the father of A, the mother of A or the grandparents of A”. For the Giay, being called by their children’s name is a source of happiness and pride. If someone intentionally calls them by their original name, this is an offense to them. The naming ceremony of the Giay is of great importance for them, reflecting the continuation of generations and the family order.